The authors investigated whether the human immunodeficiency virus (HIV) has restrictive effects on the variable region of the beta chain (V beta) of the T-cell antigen receptor (TCR), by in vitro cultivation of non-HIV-infected peripheral blood lymphocytes with one of six HIV antigens or heat-inactivated whole virus (HIV-HI). Resting and blastic CD4+ and CD8- cells were assessed with 3-colour cytofluorometry and monoclonal antibodies to various V beta families/subfamilies. 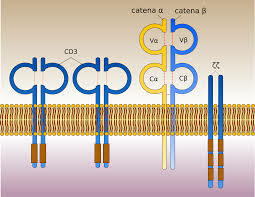 The V beta families affected include V beta’s 13.1/.3, 8, and 21 with gp 120; V beta 21 with gp 160 and RT; V beta 8 with p25; V beta’s 8 and 21 with Rev; and V beta’s 3 and 21 with HIV-2 Vpx. V beta family-specific effects with HIV-HI did not differ significantly from those found with IL-2 stimulation. Findings differed between CD4+ and CD8+ cells. For CD4+ lymphocytes, significant V beta-specific decreases were found, not the expansions found with superantigens or mitogens. CD8+ lymphocytes showed slight but significant expansions. The effects on V beta’s 8, 13, and 21 are consistent with previous studies of HIV-infected persons. However, it is difficult to accept that antigens encoded by different HIV genetic regions cause proportionate diminutions of similar V beta families. The authors suggest that these effects may be secondary to changes in cytokine profiles rather than direct interactions with TCR V beta’s.